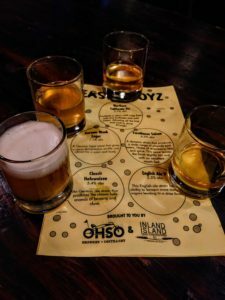 For Arizona Beer Week 2019, O.H.S.O.-Arcadia once again helped beer lovers learn about yeast's powerful role in making beer through their "Yeastie Boyz" beer program. And it is quite enlightening. Yeast was the last element to be formally recognized as one of beer's basic ingredients. Water, malted barley, and hops were long seen as the building blocks of brewing. Yeast was famously left out of the German Purity Law of 1516, mostly because it was not totally understood back then. It wasn't until the 1800s, following the work of Louis Pasteur, that yeast was cultivated and more evenly applied in brewing. Certainly, wild yeast was used in certain beers before then, but after Pasteur's work, it could be better managed and controlled. Most people, myself included, only view yeast as the "fermentation engine"--the element that will bubble up and alcohol up the beer. 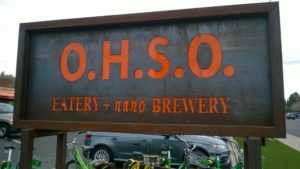 I attended O.H.S.O. 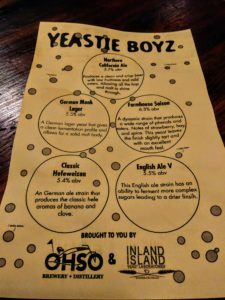 's "Yeastie Boyz" presentation on February 13 and discovered that yeast has FAR more to do with the flavor of your beer than you might think. It's really incredible. To demonstrate the power of yeast, O.H.S.O. creates a basic pale ale wort. Then, they divide it among five fermentors. Then, each fermentor gets a different yeast. 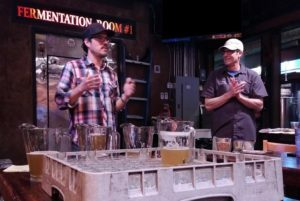 The result is five totally different and distinct beers, similar in color, but wildly divergent in flavor and mouthfeel. Who knew? The tasting at O.H.S.O.-Arcadia was hosted by Dave (of O.H.S.O.) and John Giorratano of Inland Island Yeast Labs. One of the points that John made was that yeast has to be carefully "pitched" during the brewing process. The temperature of the wort when you add the yeast, the speed at which you add the yeast, even the surrounding air and other environmental conditions can affect how the yeast interacts with the wort. Most important, brewers must properly aerate the wort, or else the yeast might die before they do their work. Brewers certainly must know their science (another reason to stay in school, kids!). Among the beers sampled were a California Ale, an English Ale, German Lager, Hefe and a Saison. To think that all five beers came from the same wort is really mind-blowing. Makes me respect the yeast!